I use three enamelled pots with cast iron cores (each is 3.5 qt. size, one round and two oval) frequently now in my bread baking---all three fit nicely into my oven at the same time--- and am delighted with the perfect crust and crumb this Lahey method delivers unfailingly. And for superior taste, I always employ a 24-48 hr+ initial cold refrigerator ferment, using ice cold water (77%), instant yeast .7%, table salt 2%, and 100% unbleached Canadian white all-purpose flour. On a stack of Bread Bibles, I solemnly (if immodestly) swear my Lahey Cold Pot Bread has no equal in the land, or in heaven for that matter. But in my opinion the method Lahey suggests for proofing and "loading" the dough into the pot is fraught with unecessary difficulties. He suggests proofing on a wheat bran-sprinkled tea towel, and then inverting this "package" and plopping it unceremoniously into the hot pot. (In the Bittman video he looks like a farmer dropping a boulder off the top of his barn). The problem is, the very wet dough looks like a wayward handful of jello, and is liable to get out of hand, literally. Furthermore, the odds are good that this very wet dough will stick to the tea towel just as you are about to upend it. 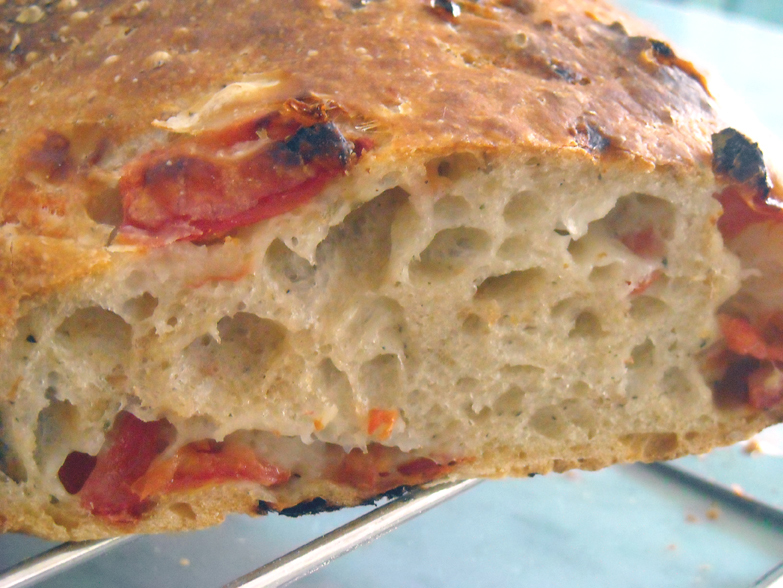 The result can be a less than perfect crust and less than perfect crumb structure. The solution I came up with does not involve using parchment paper. (I hate putting that stuff in my pots). 1. Lightly oil the bowl in which you proof the dough, and then sprinkle wheat bran into the bottom. Cover with towel and when proofing finished, sprinkle more wheat bran on top of dough. 2. When oven is heated, take pot out and place on stovetop. Close oven door quickly. Remove lid. 3. Using gloved hand, tip pot over toward stovetop. Using other hand, roll dough from bowl into the pot using a quick, decisive wrist turn. You will find the dough goes into the pot very, very gently, with the top of the proofed dough now on the bottom of the pot, with your carefully-nurtured gluten structure undisturbed. Read more about pH strips to the rescue!!! I cut up fresh cherry tomatoes and a medium sized "regular" tomato, and threw in 2 tsps ground oregano. Then I hand-mixed them into my gorgeous, gorgeous Lahey dough which had fermented for 26 hours. It was a struggle, and when it ended, I thought I had thoroughly destroyed all the gas and air in the dough. I also thought that the dough had finished all the fermenting it was going to ferment, as it looked somewhat shiny, like a kind of cheap plastic. So with heavy heart (not really, it was fun!) I let it sit in my fermenting tub for another hour and fifteen minutes, not really expecting to see any change. To my surprise, back came at least a modicum of bubbles, and, taking no chances, I poured it onto a wheat-branned towel and did a sloppy. mimimal fold job as best as I could, and turned on my convection oven to 500-degrees. Twenty-minutes later, I was dismayed to see the dough was plaster-stuck to the towel (like an idiot I should have first turned the dough onto my counter and floured it before towel-wrapping it). Getting the dough into the pot was---ahem--an adventure, (and I had to throw the towel into the garbage). There really wasn't enough dough to fill my cast-iron pot properly, and what I managed to place into it looked like it had been torn apart by four fighting pitbulls pulling from all the points of the compass. Naturally my expectations were low. Who ever heard of waiting for 26 hours to load veggies into a dough, to say nothing of eschewing the time-honoured tradition of inserting them by flattening the dough, distributing the pieces all over it, then rolling it up like a carpet? And to abuse the dough thoroughly (Lahey & Reinhart, excuse me), and pot it in such a sorry, flaccid state? 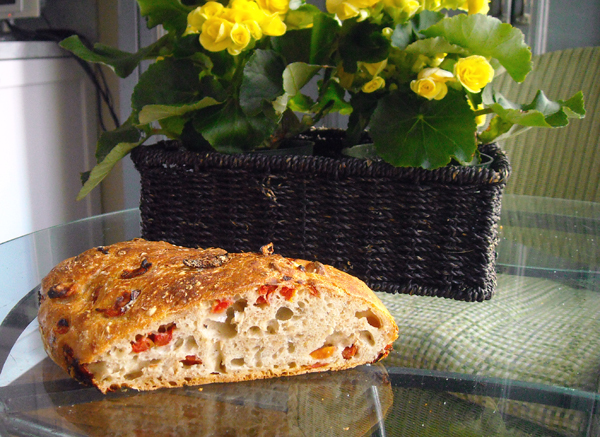 Well, this bread hardly came out singing Hallelujah --- a lot of the tomatoes gravitated too close to the crust, and the crumb was a wee bit over-moist and closed in places --- but it DID have a truly memorable crust, and the taste was first-class. Question to anyone who reads this: any suggestiuons for next time, given the same ingredients? Comments would be appreciated greatly, since I am a complete novice. See another picture below. First of all, kudos to everyone who has worked to make this such a wonderful, educational site. I am looking forward to participating in the fun here on Fresh Loaf. I have been baking from Artisan Bread in Five Minutes a Day, and the BBA, for several months now, but have had no other experience of bread-making during my 69 years of life. I thought that Artisan Bread stripped things to their esentials until I came across Lahey/Bittman bread on You Tube. Made a pot yesterday, and must say the first time was a charm. The crumb and crust are obviously excellent looking (though the crumb may well be too thick for some people), but I found the taste a little disappointing, after the long --- 19-hour ---- ferment. It was good, but not nearly so good as some Ancienne baguettes I made recently following BBA religiously. With those loaves, I died and went to heaven. I have two questions: (1) does maxiumum taste seem to be an issue with this manner of baking? (2) if the fault was mine, does anyone have any suggestions re getting superior taste when using this method?